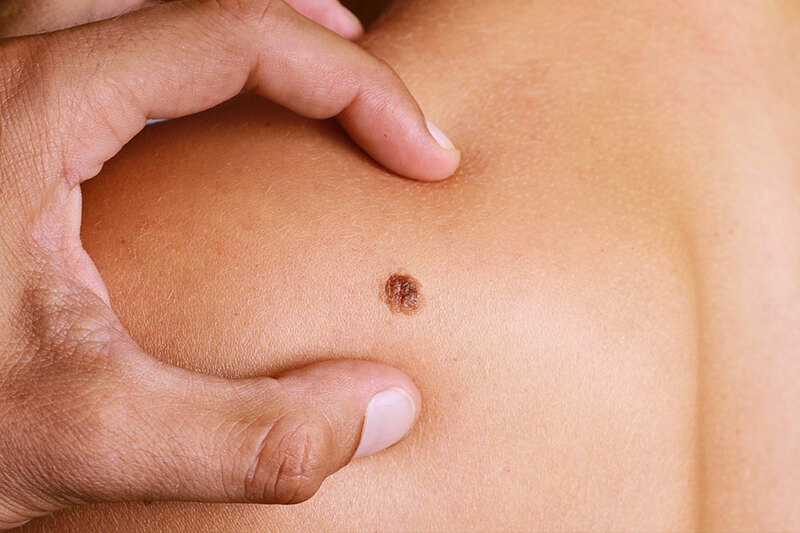 It’s estimated that one in five Americans will develop skin cancer in their lifetime. In fact, nearly 10,000 people will die of melanoma in the U.S. this year. That’s why early detection and treatment of any type of skin cancer is so important. Skin lesions are typically identified during a visual exam by a doctor. When basal and squamous cell cancers are identified early, they’re usually treatable and curable. These types of cancers are typically non-aggressive and slow growing. Treatment depends on the size and location. These types of cancer can usually be treated with either prescription ointments or a surgical procedure known as an excision, most often performed on an outpatient basis in the doctor’s office. Excisions use a local anesthetic, meaning that pain is minimal. In some cases, your doctor may recommend radiation treatments. Once removed, a pathologist will analyze the lesion and determine if all cancerous tissue was removed. If the “margins,” or surrounding tissue, come back negative, no further treatment is required. However, it’s worthwhile to seek regular skin exams afterward. Melanoma, an aggressive skin cancer, belongs in a category of its own because of its ability to spread and be potentially fatal. As a result, surgery is often the only real treatment option. In most melanoma cases, we perform a full-thickness biopsy of the skin lesion to see how deep the lesion is. If a large amount of tissue needs to be removed, or if it’s an area that is highly visible, the surgeon will often work with a cosmetic surgeon to minimize the appearance of scarring. The sooner skin cancer is diagnosed, the better your chances for a positive outcome. Examine your skin regularly on your own and with a physician. If you spot something suspicious, make an appointment with your doctor. Remember, A-B-C-D-E.
Those who are fair skinned or have light eyes face a higher risk for skin cancer. If you have a history of skin cancer, you should be checked on a regular basis, and at least once a year. Use sunscreen! Most skin cancers are sun exposure-related. Use a high-SPF sunscreen beginning at a young age and continue the routine throughout your lifetime. Dr. Bradford Gray is a general surgeon at Newport Hospital, specializing in the management of benign and malignant breast conditions, thyroid surgery, endoscopic procedures, management of malignant skin conditions, including melanoma, and advanced laparoscopic surgery. Learn more about Dr. Gray in this video. Is it sunburn or something more? For many people, getting a sunburn is one of the main health concerns of summer. It’s the season of shedding clothes and feeling the warm sunshine on your sunscreen-covered skin.